We’ve just returned from a fabulous week in Vietnam, travelling from Hanoi down to Hoi An via Hue, sampling delicious, often new, and usually pretty exciting foods along the way. Sadly, however, our enthusiasm for street food was not matched by our weak Western stomachs and by the end of the trip both the Perky Kebab and I had succumbed to food poisoning. Not a fun way to end our holiday! By the time we staggered back into our condo on Saturday night we were pretty ready for some plain, nourishing, healing food. 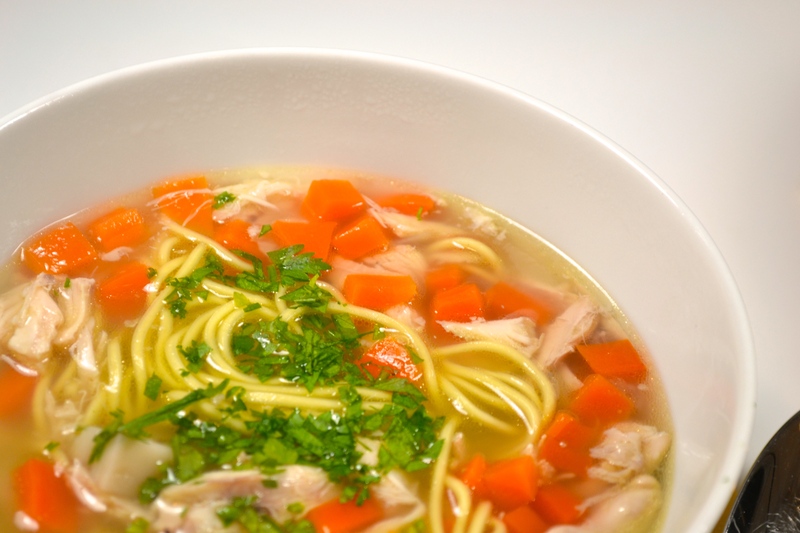 And what could match this description more perfectly that a bowl of homemade chicken noodle soup? Making your own stock is clearly a lot of effort to go to for a bowl of soup and not something I’ve ever done previously when picking up a lovely pot of it from Waitrose was so easy. 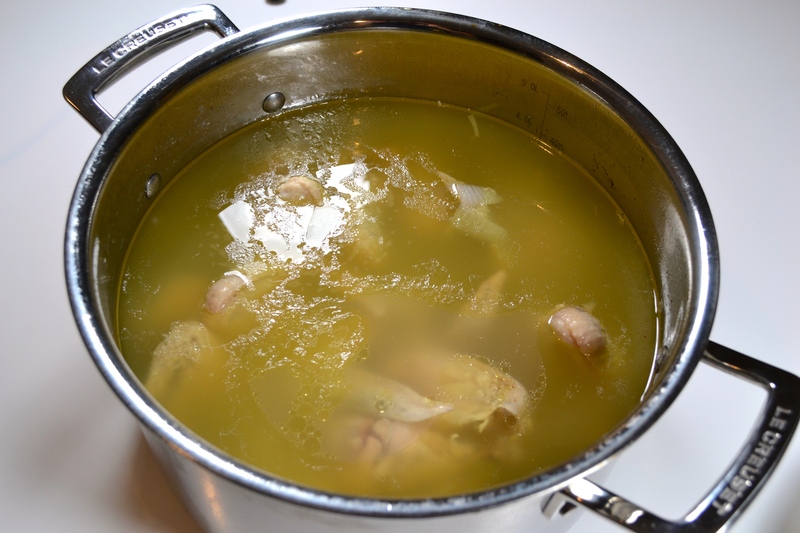 But sadly, ready-made chicken stock is not easily available in the supermarkets here, so home-made it had to be. And it must be said I’m so happy I did. There’s something very therapeutic about making a dish from scratch and the finished stock did taste incredible. The base of this stock is chicken wings, however the chicken wings I buy from my local wet market are not anything like the scrawny excuses for them that you find in UK supermarkets. So if you can’t get deliciously meaty wings that look like they would have enabled a chicken to fly at some point, then I suggest using drumsticks or thighs instead. If you have a pressure cooker the soup making process will take you about an hour and a half I would think: 45 minutes to make the stock in the pressure cooker, a bit of time to pull the meat off the chicken bones and strain the stock, and 20 minutes to make the soup. If you don’t have a pressure cooker, you’ll need to set aside around 5 hours as ideally the stock should simmer very gently over a very low heat for 4-5 hours. 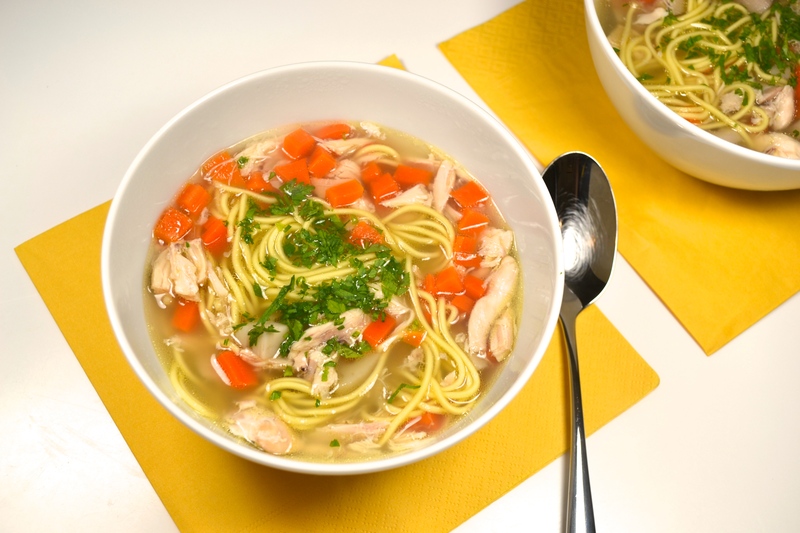 I’ve kept the soup pretty simple with only 6 ingredients, however you can add anything that takes your fancy. My version below include the slightly bizarre addition of lotus roots. 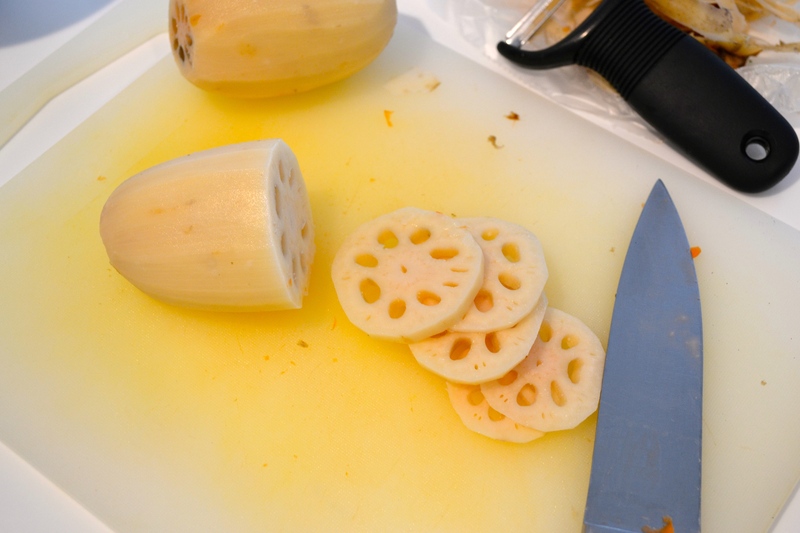 This is mainly because upon asking the vegetable uncle at the wet market what on earth it was he serendipitously replied: “lotus root – perfect in soup”. So obviously I had to include it. The gamble of including a mystery vegetable in the soup paid off as it’s delicious. It holds it’s crunch even after 15 mins of boiling and has a mild flavour slightly like water chestnuts. I don’t think you’ll find these in the UK or outside of Asia though so if you can’t, celery is the perfect substitute. Hopefully either with or without lotus root you’ll find this soup as restorative as we did. Enjoy! 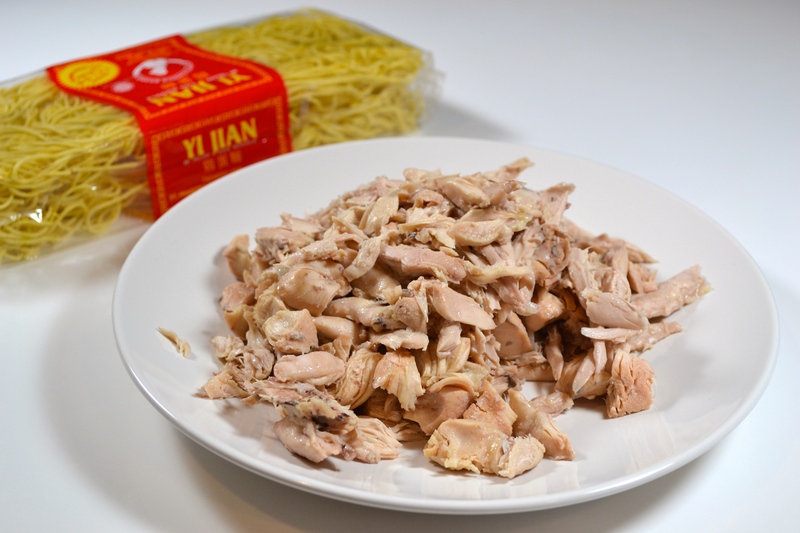 The meat from the chicken wings you used to make the stock or about 200g shredded chicken. 1. If you don’t have a pressure cooker: Place all of the stock ingredients in a large pot, cover and bring to the boil. Once at boiling point, turn the heat down so that the pot is barely simmering and cook for 4-5 hours. Keep an eye on it and if a lot of water has evaporated top up the pan slightly (don’t top up too much though otherwise you’ll dilute the delicious stock too much). If you do have a pressure cooker: Place all of the ingredients inside and cook for about 45 minutes. 2. 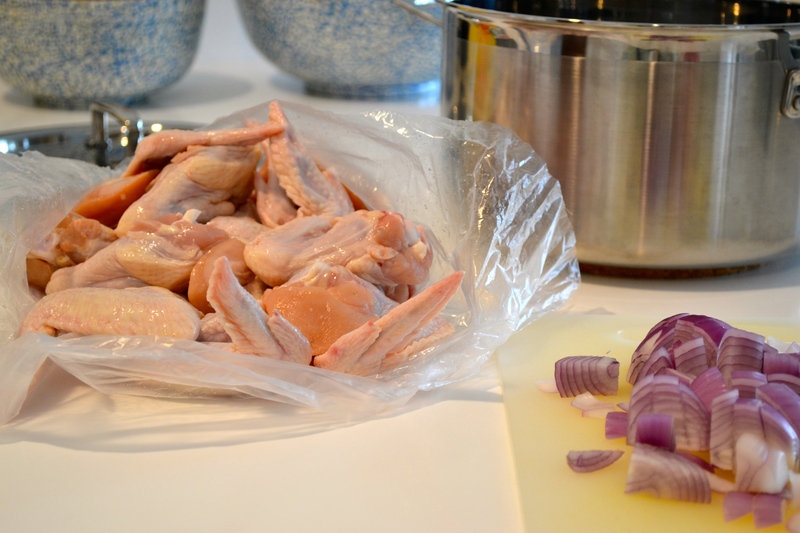 Remove the chicken wings from the saucepan/pressure cooker and put to one side to cool before taking the meat off the bone to use in your soup. 3. Line a sieve with some muslin or a clean teatowel and place over a pot big enough to hold your stock. Slowly pour the stock through the muslin/teatowel and allow to drip through. Ta da! Your stock is ready. 1. Pour the stock into a large saucepan. 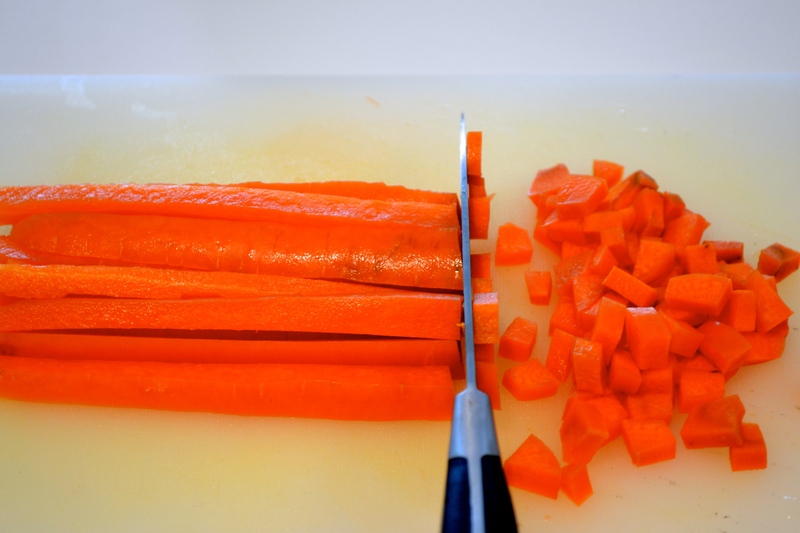 Add the carrots and lotus root/celery. Cover and bring to the boil then simmer for 10 minutes. Add the chicken to heat through for a further 5 minutes. Finally add the noodles and cook according to the packet instructions (usually about 2 minutes). 2. Have a taste of the soup and season with a little salt and pepper if needed. Serve sprinkled with the chopped parsley. The recipe above obviously makes a lot of soup but it is very freezer friendly and keeps for a few days in the fridge happily too. The noodles are a lot softer after the first day though as they continue to soak up the soup. If you don’t like the idea of this, you can just add the noodles when reheating the soup instead. food poisoning is the worst- soup is great when you’re trying to nurse yourself back to health. Your photos are beautiful- what do you use to take them? If you’re interested, I’d love for you to share a post in my blog link up tomorrow. There’s an explanation right on my main menu under ‘Tell em Tuesday’.